I’m not the first to make the observation that schools are just a series of cliques forced into the same room for 45 minute periods of pretending to learn. There are obviously many cliques it’s possible to fall into. The Goths, a breed that I can associate with in as much as I hate sunlight and quite enjoy the moany tones of The Smiths and The Cure. There was the cool kids who at my school seemed to be mainly about people who found farting on each other’s heads and being douche’s hilarious. I fell into neither of these groups, I didn’t even fall in the sporty clique or the nerds, I was a nomad, I had really good friends in each group, but I could never commit to one or the other. This lead to me seeing a lot of things from the outside but never taking part for example; the sporty kids who actually did exercise, something I’ve witnessed on many occasions but never participated in myself. The nerds was where my interest was really piqued though. They knew things and did things which just fascinated me. There was actually a sub-group within the nerds; nerds means many things to many people, a higher level of intelligence or a fascination with Dragons and Orcs, well our nerds contained both sub-species (smart and fantasy not dragons and orcs). The thing is I wasn’t much better myself; I from an early age had an obsession with computer games, but that was relatively hidden at school, it wasn’t until university I was truly open as to how into games I was. These nerds were open about their interests and not ashamed of it, they would play quick sessions of Dungeons and Dragons on the school field and the collectable card game Magic: The Gathering. I was curious, I went as far as to buy a few packs to be able to build a deck, but short of looking at the pictures, I can’t remember ever actually using the cards. 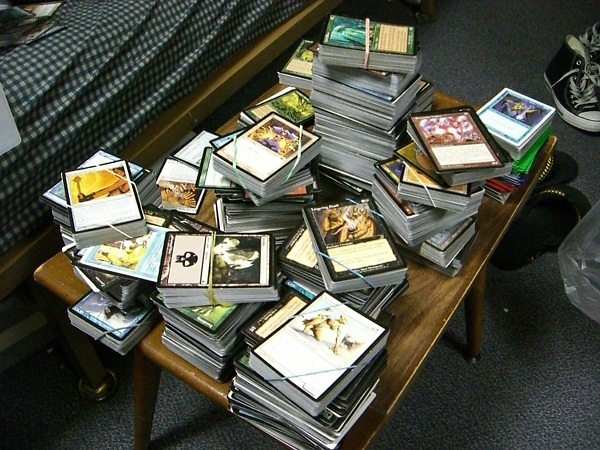 Magic: The Gathering is a game that has been knocking around since 1993, it has had many card games that are essentially rip offs, like Yu-Gi-Oh or Pokemon, unfortunately Wizards of the Coast didn’t have the foresight to base their game on a quite poor Asian cartoon. 13 years later and here we are again, a socially awkward nerd afraid to take the first step into a new hobby, that is until my girlfriend, Harriet, and I started playing board games. We have played many over the past 6 months, with forays into Zombies!!! !, Gloom (as reviewed here), A Touch of Evil and Munchkin. The main thing that’s interesting us is the concept of what we’ve been referring to as “Alternative Boardgames”. We have little to no interest these days in Kerplunk or Mousetrap, but games like I mentioned above feel like they’ve been made for adults without involving either alcohol or the type of Charades that most people crack out at parties to break the ice. I’d been reminded of my teenage years and seeing kids play Magic and I wanted to give it a try. I went to a store nearby (Game On in Cheltenham) and decided to just dive in head first and by 2 introduction packs, one for myself and one for my girlfriend. After having a quick read up on Magic I realised that the cards and the world it is set in still fascinate me. The basic premise follows there are 5 types of land, these lands are represented by colours. The Islands (blue), The Forest (green), The Swamp (black), The Mountains (red) and The Plains (white). 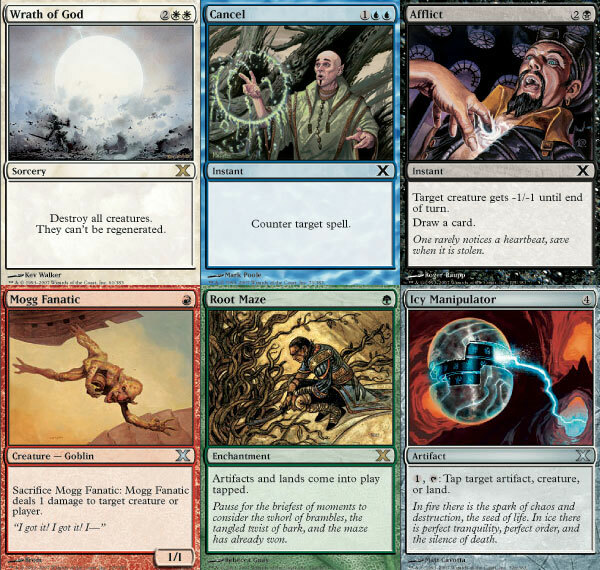 These 5 lands each have a set of cards that are associated with it. After all this time the cards have amounted to thousands and as a new release comes each year this is clearly only going to grow. The aim of the game is simple, your enemy has 20 life, this number needs to be reduced to 0. To do this you play cards that have creatures on them that can attack the other player, unfortunately the other player can block attacks with creatures they have played. 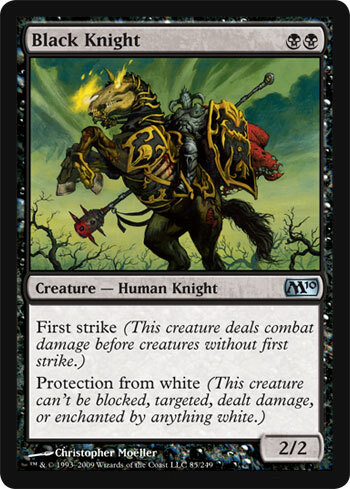 Creatures, and other cards, have a cost however, and this cost is the land you have, creatures on red cards for example require mountain land cards to be played and black card creatures require swamps. Very quickly this game turns into a quite interesting resource management simulator; like Age of Empires for people who are into Hobbits. As well as creatures players also get artefacts and spells thrown into the mix. If it sounds complicated it is because it is. I will say now that I have played about 10-15 games of Magic over the past couple of weeks, and the rules still evade me like sleep to an insomniac. Game On, and many other shops around the world, have weekly Magic: The Gathering sessions for players to come and trade their cards, as well as ask for rule clarification, unfortunately as I mentioned above I’m socially awkward so didn’t really feel inclined to do this. There is a light at the end of the tunnel however if you are tempted to give it a go but don’t know anyone who can explain the rules, Magic 2013 on the iPad. This iOS game explained so many rules to me that I didn’t understand before, it is free and just by playing the first 4 duels in the game you will learn enough to at least give you a fighting chance against someone. Harriet and I have played a few games now and only once did it end in bickering, which for us is a sign of a good game. What even today I find most enticing about the game though is the cards. The artwork on them is of such high quality you can happily read every blurb in your deck and see the flavour text for each whilst having fantastical artwork to aid. Building a deck is where this game becomes a real sign of skill, novices like me will want to fill their deck with each colour, but after playing a game you realise that this is unwise due to the probability of picking out the right coloured land to play your hand. Decks can be any size though too many creatures and not enough land is an awful position to be in, I’ve read that around 60 is the best size deck though it’s down to each individual and their play style. 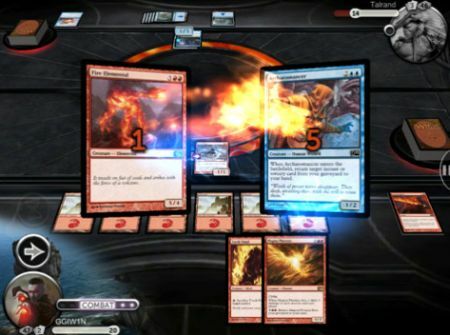 Overall as an initial experience Magic: The Gathering is a great game, it provides the player with the ability to build their own original deck that they can take into a duel against one or more people. Getting an initial intro deck and a box of cards to boost your collection may set you back about £40 to start with but once you have your set you are ready to go and with the ability to change the deck you take into games the replay value is great. I hope to keep up with articles every so often to let people know what it’s like to start off in a game like this and the perils and pitfalls of having the tactical ability of Napoleon…After he died.